Who said you were too old to skip rope? 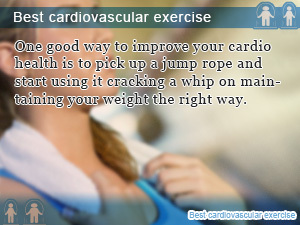 In fact jumping rope for exercise is one of the best cardiovascular exercises you can do without going to the gym. Jump roping makes a great workout routine for getting in your cardiovascular exercise with the need of no special equipment only a jump rope. Jumping rope for exercise is inexpensive and gets the job done right improving your cardiovascular health while helping your lose weight. Is jumping rope a good way to lose weight and getting back in shape? There is no easier diet exercise for weight loss than spinning a rope around your body like jumping rope for exercise. Pinning down the important points that any one that wants to make their jump rope workout routine worthwhile, you need to know what it takes to do jump rope exercise without hurting yourself. 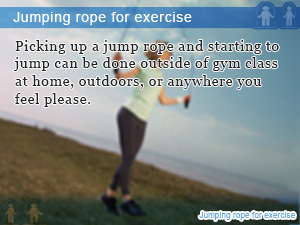 It's important to keep in mind that how you jump when jumping rope is just important as doing the exercise. You will know just how important good form while jumping rope is going to make your cardiovascular exercise show the results you are looking for. In this daily Slism, we will go straight into jumping rope for exercise with a jump rope workout routine for cardiovascular exercise to help burn more calories while improving your fitness conditioning to jump back into the routine of regular exercise. A jump rope makes a great material to tie someone up for fun. In fact, a jump rope is an indispensable piece of exercise equipment for athletes and fitness buffs alike. Particularly boxers use them for their training exclusively. Taking up a jump rope may be the best thing you can do for your body for better cardio. Rope jumping forces you to use your whole body while you exercise. In order to swing the rope over your head, below your feet, and around your body you must use your arms and shoulders. In the process, you use your legs jumping into the air propelling your body above the ground for a smooth pass of the rope bellow your body. Athletes already used to performing clean smooth jump roping can do it at high speeds and even in combination with techniques that seem difficult. Executing breathing while you exercise helps you burn fat and calories at the same time. That is why taking up jump rope is thought to be just what you need to get fit. Generally speaking, when looking to take up jump rope in your diet, you won't want to overdo it like you would in the same matter as athletes and workout fanatics would with increasing speed and technique that are hard to grasp for beginners. This is where aiming for fitness over performance is key in continuing long enough to see results. Until your body is used to jumping rope it's important to set up steps in your workout routine to get up to pace safely with minimum burden on your body as possible. A good rule of thumb is to exercise for 10 to 30 minutes at a time spending the first 10 minutes warming up and stretching. In order to get your lower body acclimated with hard exercise start with shorter exercise periods while gradually increasing the amount of time you spend exercising as your condition improves. When you first start jumping rope exercising for 10 minutes max is recommended. What you will find out is that sustaining jump rope exercise even for this short period of time can be difficult and most probably leading to muscles sores that can be prevented more or less by stretching and warming up properly. Chances are that you won't be able to maintain jumping rope for the whole ten minute time period. How you get around this is not giving up and most importantly breaking exercise down into iterations allowing time for uninterrupted exercise and taking a break such as jumping rope for 1 minute followed by 2 minutes of rest in series. Another scenario that you can pick up is jumping rope for 60 seconds flat followed with 30 seconds of rest time. Again, if you find it hard to continue jump rope for this period of time you can either decrease the length of time you spend jump roping or add more rest time in rotation. Once you've become able to keep up jumping rope for a whole minute increase the number of sets of rope jumping in your routine while maintaining a consistent rest time from once every 2 minutes to ever 3 or 4 minutes max. As much as you would not like to admit it, jumping rope along isn't going to make it fun and satisfying without learning jumping techniques that give you bragging rights to show what you are getting out of your workout plan besides losing weight. Note that by applying different jump rope techniques you effectively change the target area that you are working on in your exercise building speed and endurance in wherever you see fit. Taking up rope jumping doesn't stop at changing how much you weigh. There are changes in your body that take place after continued jump roping exercise that you can look forward to that are as follows. Although jump roping can being done just about anywhere including the spot in front of your house and at the park, choosing the right place to jump rope can make a big difference in the burden that doing this exercise has on your body. What’s in your calisthenics workout routine? It better be radio exercise because if not you would be missing out on the great benefits it has in your diet. There is no better way to be more eco-friendly than taking up bicycle exercise lifting a hand against global warming one mile at a time spending more time outdoors. What’s your workout? 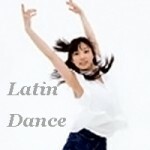 For some people enjoying the slimming effect of dancing, latin dance exercise is it. Zumba along with other dance routines may be what you need in your life to stay fit and maintain your weight with ease that feels just like dancing. Continue reading for a brief look at what is latin dance exercise and what it can do for you in fitness. Picking up a jump rope and starting to jump can be done outside of gym class at home, outdoors, or anywhere you feel please. The exercise plans that work the best or those that throw in a little variety into your routine. Jump roping helps you do just that and more. One good way to improve your cardio health is to pick up a jump rope and start using it cracking a whip on maintaining your weight the right way.